It was co-worker Jarod Higginbotham who turned me onto the Two-Timing Steelhead Rig when he hooked two fat steelheads, in just a few casts, on this double rig suspended under a float while drifting his outfit through a pool where fresh steelhead were holding. The double set up works for more than just steelhead as we’ve caught trout, cutthroat, whitefish, and coho salmon while using it. Besides being effective for nearly every river species, the Two-Timing rig is easy to tie up and use. It’s float fishing with a steelhead jig suspended under a pencil shaped bobber with a leader, 18-to-24 inches works, extending from your jig to a LiL’ Corky single-egg-imitation and hook. The Corky is pegged, held in position on your leader, a few inches above the hook by wedging a tooth pick where the leader threads through your Corky and breaking it off flush with the imitation egg. The sizing of the hook and Corky are important because your goal is to offset the buoyancy of your Corky with a hook large enough to make it sink below your jig, but not so heavy a hook that it inhibits the Corky’s ability to look natural as it drifts along. In addition, you can increase your odds of success by setting your bobber such that your Corky will nudge bottom occasionally as it drifts downriver a few feet under your jig. I remember Jarod being more than a little excited as he explaining to me how the buoyancy of the Corky helps float the hook point up (meaning you get hung on the bottom at lot less often) and how the larger/heavier hook required for this set up produces more-hookups-per-strike due to the bigger point-to-shank gap as compared to that of a smaller hook. The first time we tried it together we landed four steelheads; three came on the Corky as compared to one on the steelhead jig located just a few feet up the line. With success like this, it’s like: why not add a leader and Corky to your steelhead jig when float fishing? Float fishing is similar to the drift fishing method in that you cast out, across and slightly upstream, pick up the slack line between you and your float, and allow your float, jig and Corky (suspended below your jig) to drift downstream and through the holding water. Your drift is complete when your outfit nears the tail out, jig begins hitting bottom, or you cannot eliminate line drag by mending, which is when you’ll need to reel in and cast again.Float fishing consists of a series of casts, drifts, and retrieves. 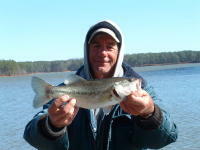 Because you’re fishing with your eyes rather than by feel, you’ll need to keep close tabs on your bobber at all times. When/if your bobber goes down/disappears (signaling a fish has taken youroffering) you must quickly and immediately set the hook. In all cases, a drag-free drift with your float moving at or a bit slower than the river current is critical to success. If you’re fishing a current edge, that is, where slack and moving water meet, on the near side of the river, you should have no problem with line drag. It may be a different story if you’re casting out into a hole or drift where river current, especially a strong one, can grab your main line the moment it hits the water’s surface and push it downstream faster than your float is moving. One way to reduce or momentarily eliminate line belly and its effect on maintaining a natural drift is to mend your line. 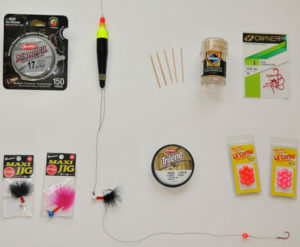 Line mending is something fly anglers do, for the same reason, to prevent their fly from skating across and downstream too fast. To mend your line, start with your rod tip at a low angle and pointed at your float, progressively pull your rod tip up and backward (toward you) while rolling your rod tip and line upstream. When you mend, it’s important to do so aggressively enough that your main line will be tossed upstream all the way to your float. Given a strong current combined with a cross current cast, you may have to mend your main line several times during a single drift. Casting out at a slight downstream angle and feeding line off your reel fast enough that your bobber won’t be overcome by line drag can reduce or eliminate the effects of line belly on your bobber. If you’re a boater, you can cast out to the side or at a 45-degree angle downstream too, but you may find better success and eliminate all line drag by anchoring above the area you wish to fish and maneuver your bobber directly downstream from your anchored boat. 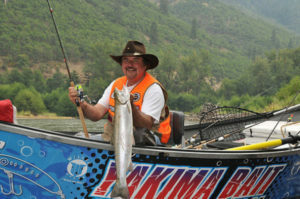 Float fishing works best when the rivers are medium to low in height and the water is clear. And although float fishing will work anywhere fish hold, it’s especially effective for fishing current edges, where fast and slack water meet, a place where steelhead often hold. Most anglers will suspended their jig half to three quarters of the way to the river bottom when fishing areas where the water is eight feet or less in depth and within a few feet of bottom where it’s deeper. The two-timing rig means adding an 18-to-24-inch leader to your jig – just tie the leader to the bend of your jig hook and slide the knot up the hook shank toward the jig head, which will allow your jig to suspend below your float in a horizontal position (the fish like this jig presentation best). In more turbid water or at times when fish might respond to a larger egg imitation, try a size 10 or 8 Corky rigged in combination with a size 1/0 single hook. The key here is to peg your Corky 2-to-3 inches above your single hook with a round tooth pick. The buoyancy of the Corky floats the hook point up so you get hung up less with it as compared to using a bead or other non-buoyant egg imitation. Although any hook color will work there are times when a red colored hook might out-produce a bronze or nickel colored one. This outfit can be even more effective if you set your bobber such that the hook pegged a few inches below your Corky taps bottom occasionally as it drifts downstream in the river current. This entry was posted in How To Fish, Trout and Salmon on February 5, 2019 by ronniegarrison.